Whittier Tech provides a wealth of resources to support our students. While an exceptional education is at the heart of Whittier's mission, providing students with a range of experiences and opportunities to express themselves allows us to promote a well rounded student body, prepared to take on the world after high school. We are pleased to welcome Whitsons Culinary Group and new Food Service Manager Kevin Welch to Whittier Tech! Students can look forward to expanded menu options each day that include the daily hot selection, hot and cold sandwiches including wraps and burgers, a variety of pizzas and calzones, Mexican fare including tacos and nachos, freshly made build-your-own salads, fruit smoothies and many other delicious items! Also new this year is the addition of a premium meal option which will include specialized items such as Boars Head meats. You may prepay for lunches using MySchoolBucks. Whittier student life includes a range of extra-curricular activities for students to expand their horizons, express their talents, and help others. From artistic expression in the chorus and school musical, to service clubs such as Key Club and Interact, to more intellectual pursuits such as chess club and FIRST Robotics, Whittier has something for everyone. Whittier Tech has a proud history of fielding some of the very best teams in the Merrimack Valley. Student athletes at Whittier reap the benefits of having many of their academic and vocational teachers also double as their coaches and trainers, ensuring that the same high standards of conduct, respect, and performance we expect in the classroom are demonstrated on the playing fields as well. Athletic Director Kevin Bradley and the Whittier athletic department host all the schedules, sports forms, and message boards for all sports over at our 8to18 partner website. At times when students are in the care of Whittier Regional High School, the school shares with the parents/guardians responsibility for the health of students. Please contact the Nurse's Office when medical information needs to be updated or shared. In all matters of health administration, the privacy rights of students are observed. Every day, in every class, Whittier Tech students interact with the latest technology. Whether it's computer controlled milling machines in Machine Tech, or the latest 3D modeling and printing technology in CAD/Drafting, Whittier invests in the latest and most popular technologies in use by industry and business today, to give our students a leg up when they enter higher education and the workforce. Sign up/log in for iParent to gain access into your child's classes and teacher's rankbooks to see grades, assignments, and more. Whittier Tech is proud to be a 1:1 school - each and every student is provided a school owned iPad. Technically savvy and innovative instructors create lessons that include individual and cooperative learning, self-paced assignments, peer editing, virtual biology dissections and more. Incoming Freshmen parents are required to attend an hour long briefing on how the iPad is used, our student expectations, and detailed information on how we protect your student's privacy online. We also offer a voluntary additional protection plan for the iPads that is very popular and affordable. See the link below for detailed information. Whittier provides transportation to and from school, including late buses for extra help on Tuesday and Thursdays, and after sports practice and games, ensuring everyone can participate in extra-curricular activities. Haverhill St. @ Longmeadow Dr.
High St. @ Rosewood Dr.
High St. @ Mineral St.
High St. @ North Main St.
Jeffrey’s Neck @ Northridge Rd. County St.. @ green St.
County St. @ South Main St.
Market St. @ Depot Sq. Washington St. @ Cottage St.
Linebrook Rd. @ Howe St.
Linebrook Rd. @ Leslie Rd. Haverhill Rd. @ Boxford Rd. East Main St. @ Elm St.
Pond St. @ Prospect St.
Pond St. @ Mill St. Seven Star Rd. @ Holly Ln. School St. @ Wilbert Ave.
Salem St. @ Staunton Rd. Uptack Rd. @ Berrywood Dr.
Andover St @ Bailey Ln. Andover St. @ Hamilton Terrace. Andover St. @ Cedar Ln. West Main St. @ Weston Ave.
West Main St. @ Richardson Ln. Center St. @ Rollins St.
Garrison Ave. @ Francis Ave.
Low St. @ Coltin Dr.
Pond St. @ Greenleaf St.
Hanover St. @ Walton St.
High Rd. (1A) @ Plummers Ln. High Rd. (1A) @ Old Pine Island Rd. North End Blvd. @ 67th St.
North End Blvd. @ 53rdSt. North End Blvd. @ 20thSt. Water St. @ Marlboro St.
Water St. @ Bromfield St.
Merrimac St. @ Titcomb St.
Merrimac St. @ Carter St.
Walnut St. @ Woodland St.
High St. @ Woodland St.
High St. @ Ashland St.
Merrimac St. @ Moulton St.
Elmira Ave @ Ferry Rd. Storey Ave. @ Kelleher Way. Storey Ave. @ Philips Dr.
Turkey Hill Rd. @ Storey Ave.
Turkey Hill Rd. @ Longfellow Dr.
Stewart St. @ Donavan Dr.
Bridge St @ Steed Ave.
North St. @ Charles St.
North St. @ Web Rd. Warren St. @ Village Ln. Jackman St. @ Warren St. & Elm St.
Central St. @ Fatherland . Main St. @ Hammond St.
Main St. @ Warehouse Ln. Central St. @ Orchard St.
Garden St. @ Rogers St.
Haverhill St. @ Leslie Rd. Tenny St. @ Patriots Ln. North St. @ Silver Mine Ln. North St. @ Parsonage St.
King St. @ Old Jacobs Rd. King St. @ Rocky Woods Rd. Main St. @ King St.
Main St. @ Cranton Ave.
Kimball Rd. @ Attitash Rd. Kimball Rd. @ Newton Rd. Newton Rd. @ Powow Cove Ln. Whitehall Rd. @ Cynthia Ln. Whitehall Rd. @ High St.
Whitehall Rd. @ Whittier Ave. Friend St. @ Greenleaf St.
Greenleaf St. @ Sparhawk St.
Congress St. @ Madison St.
Clinton St. @ Market St.
Market St. @ Fern Ave.
Elmwood St. @ Back River Rd. Folly Mill Rd. @ Locust St.
Monroe St. @ Ash St.
Elm St. @ Amidon Ave.
Elm St. @ Lafayette St.
Merrimac St. @ Beacon St. Pleasant Valley Rd. @ Riverfront Dr.
Main St. @ Viking St.
Toll Rd. @ Pike St.
Lafayette Rd. @ Forrest St.
Beach Rd. @ Dock Ln. Ferry Rd. @ Samantha Way. Elm St. @ Mudnock Rd. Baker Rd. @ True Rd. Baker Rd. @ Red Ridge Rd. Baker Rd. @ Rabbit Rd. Haverhill Rd. (110) @ Hoyt Ave.
Middle Rd. @ Cottage Ln. Merrimac St. @ Little Pond Rd. Ferry Rd. @ South Riverview St.
Cross Rd. @ Ferry Rd. South Main St. @ Forest Acre’s Dr.
High St. @ Arch St.
South Main St. @ Kensington Ave.
South Main St. @ Presidential Dr.
Salem St. @ Colby St.
Salem St. @ Peabody St.
Salem St. @ South Porter St.
Washington St. @ Center St.
Main St. @ Wharf Dr.
Gardner St. @ Pleasant St.
Middle Rd. @ Kimball Rd. Main St. @ Bachelor St.
South Pleasant St. @ South Prospect St.
South Prospect St. @ South Main St.
Kingsbury Ave @ South Maple Ave.
Kingsbury Ave. @ Hyatt Ave.
Lincolnshire Dr. @ Devonshire Ln. Lincolnshire Dr. @ Chadwick Rd. Chadwick Rd. @ Boxford Rd. Rosemont St. @ Hilldale Ave.
Hilldale Ave. @ West Rochambault St.
Hilldale Ave. @ Bateman St.
Hilldale Ave. @ Willie St.
Hilldale Ave. @ Kathy Dr.
Hilldale Ave. @ Brook St.
Pilgrim Rd. @ Brook St.
Washington St. @ Observatory Ave.
Washington St. @ John Ave.
Kenoza Ave. @ Longview St.
Main St. @ 6th Ave.
Main St. @ 8th Ave.
Main St. @ Brookline Ave.
Gile St. @ Solitaire Dr.
Gile St. @ Woodland Park Dr.
North Ave @ Haley Rd. North Ave. @ Tenadel Ave.
North Ave @ Sagamore Pl. Main St. @ 14th Ave.
Main St. @ 10th Ave.
Lawrence St. @ Hamilton St.
Lawrence St. @ Fountain St.
Webster St. @ Summer St.
Water St. @ Buttonwoods Ave. Mechanic St. @ Groveland St.
Fernald Ave. @ Groveland St.
Boardman St. @ Golden Hill Ave.
Mill St. Across from White Ave.
Mill St. @ Arlington St.
Mill St. @ Saltonstall Rd. Elliot St. @ Shattuck St.
Lowell Ave @ Lansing Ave.
Lowell Ave. @ Washington St.
Lowell Ave @ Carlton St.
River St. @ Alpha St.
River St. @ Toby Ave.
River St. @ Western Ave.
River St. @ Revere Ave.
River St. @ Maxwell St.
River St. @ Bowley St.
River St. @ Hall St.
Millvale Rd. @ Powdermill Rd. Kenoza St. @ Golden Hill Ave.
Keeley St. @ Race St.
Lincoln Ave @ Madison St.
Lincoln Ave. @ Jefferson St.
Groveland St. @ Douglass St.
Groveland St. @ Woods Ave.
East Broadway @ Marina Dr.
East Broadway @ Bradsfield Dr.
Hadley Rd. @ West Hadley Rd. Hadley Rd. @ Equestrian Way. Highland Rd. @ Battis Rd. AM Church Street @ Sweetsir School….PM Church St. @ Winter St.
Harriman Rd. @ Brush Hill Rd. Bearhill Rd. @ West Shore Rd. Haverhill Rd. @ Spindle Tree Ln. Haverhill Rd. @ Old Taverne Ln. West Main St. (110) @ Attitash Ave.
East Main St. @ Mill St.
West Main St. @ Birch Meadow Rd. West Main St. @ Westminster Rd. West Main St. @ Gunnison Dr.
Primrose St. @ Charles St.
Methuen Rd. @ West Lowell Ave.
Broadway @ Silver Birch Ln. Village Woods @ Old Yankee Rd. Liberty St. @ Sawmill Ridge Rd. Liberty St. @ Crystal St.
North Broadway @ Diana Dr.
North Broadway @ Mariah Ridge Rd. North Broadway @ Monument St.
Primrose St. @ 8th Ave.
Primrose St. @ 16th Ave.
Primrose St. @ Ringgold St.
Main St. @ Jaffarian Rd. Main St (Rt.125) @ Woodrow Ave.
Main St. @ Woodman Ave.
Merrill Ave. @ Rosemont St.
Rosemont St. @ Alvanos Dr.
Amesbury Rd. @ Turner Ave.
Amesbury Rd. @ Atwood St.
Employment permits are required for minors under age 18. Employment permits must be issued for and maintained at the site where the minor is working. Employments permits are issued by the superintendent of schools in the city or town where the minor attends school or lives. For more information on obtaining an employment permit, please contact the division of Occupational safety at 617.626.6975 or visit http://www.mass.gov/lwd/labor-standards/ ~ For Workers and Unions ~ Wage and Employment Related Programs ~ Youth Employment. Students can obtain permits from 10:00 to 11:00 a.m. each school day, please ask for the Vocational Coordinators Office. Permits may also be obtained when school is closed by appointment by contacting the Vocational Coordinators office at 978.373.4101 x 267, or by visiting the superintendents office in the city or town of residence. From time to time, we understand that sometimes forms that get sent home get misplaced. Please find below some of the most requested forms. Whittier Tech is not only the home of our current students but our alumni population as well. We are proud of the success of our alumni and want you to share that success with our community of students, staff, and fellow alumni. Whether you went to college after Whittier, work in your vocational/trade area or a combination of both - we want to hear about it! Tell us what you've done since graduating from Whittier Tech! Thank you! While we may not use all of these submissions, if we do, we will contact you to let you know, and find out more! Looking for official high school transcripts? Visit the Guidance page under Student Life to process your request. 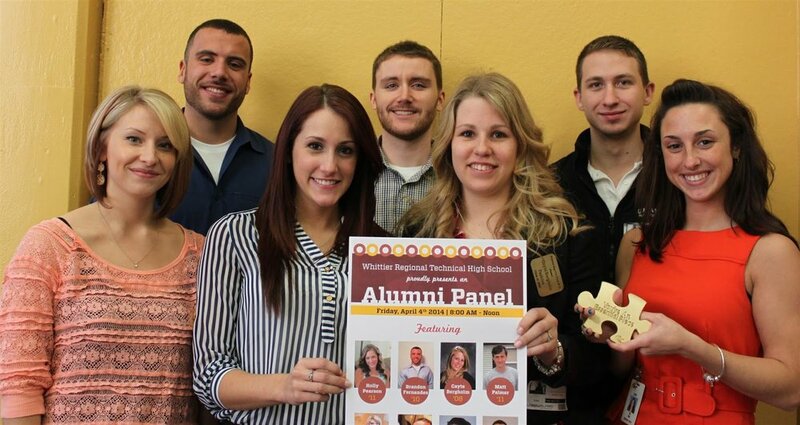 We host alumni panels throughout the year allowing current Whittier students to hear about your experiences! Alumni are able to reflect on why they chose their shop, what they wished they did differently in high school, and offer advice to current students. If you are interested in being a speaker in one of our future alumni panels, please reach out to Tia Roy, Community Services and Post-Secondary/Early College Programs Advisor. We believe it’s important for current students to see what our alumni are doing! Through the Alumni Spotlight Series, we capture the careers and journeys of many of our alumni. If you are interested in being featured in one of our posters, please reach out to Tia Roy, Community Services and Post-Secondary/Early College Programs Advisor. From time to time, we receive employment opportunities from the community that could be of interest to alumni. Current opportunities will appear below. If you have a position you'd like to post here, contact Beverly Desalvo, Vocational Coordinator.